Let everyone know when there's a train coming through with this colorful wooden whistle. 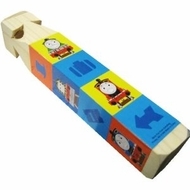 Providing hours of imaginative play, this wooden whistle sounds just like a real train whistle. Whistle features colorful Thomas and Friends artwork.